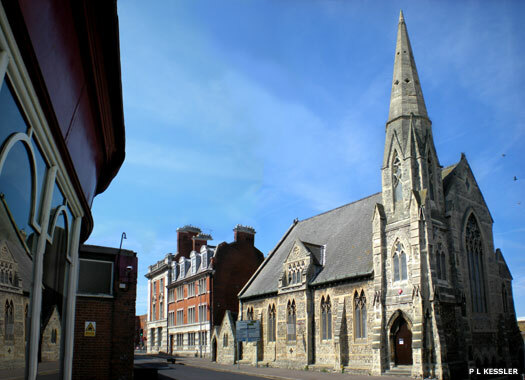 The Parish Church of St John the Baptist, on Victoria Road at the southern end of the High Street, is the most senior of the three parish churches in Margate and Cliftonville. A centre of worship for over 950 years, the first building on this site was constructed in around 1050 as a chapel of ease to St Mary's Minster. Monastic priests would walk to St John's, and to other chapels at St Peter's and St Laurence, to celebrate masses and to minister to the local inhabitants. 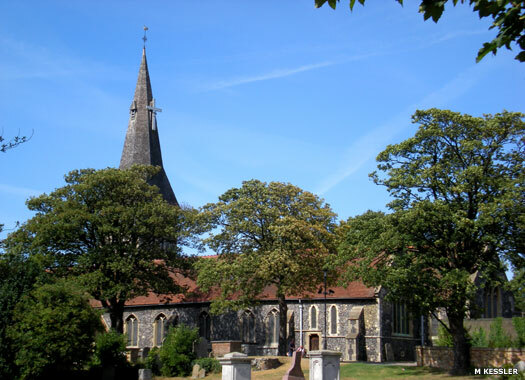 The chapels eventually became parish churches and a small fishing hamlet called Meregate or Margate developed around St John's. The first stone church was Norman, with extensions being added in around 1124 (the north chapel), and 1200 (the south chapel), although fire gutted the church in 1250. The tower was added during the repairs, and the spire joined it in the 1520s. The church was restored in 1877, when the old galleries were removed and the floor lowered. High Street Pentecostal Church is at the southern end of the main shopping area. 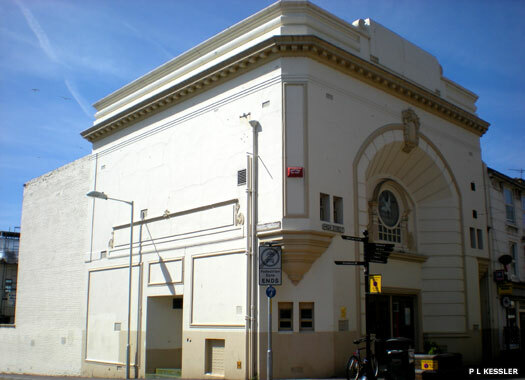 Its Pentecostal congregation became the New Life Christian Fellowship in the 1920s, the result of an evangelistic outreach crusade held in the Empire Cinema in Cecil Square, near where the library now stands. The Fellowship moved here in 1989, to what had been the Plaza Cinema, before heading to St John's Business Centre on 25 May 2003, leaving this building vacant. 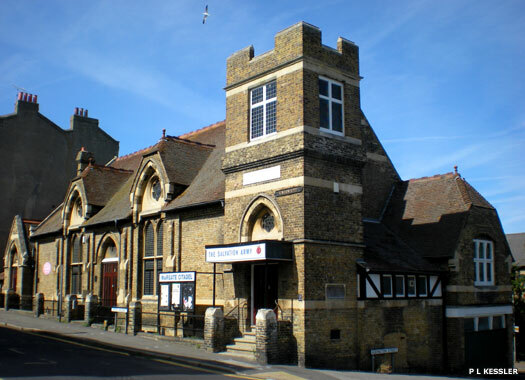 Although Cecil Square Baptist Church is the common name for this church, its official name is Margate Baptist Church. The north-facing entrance is on New Street, close to the High Street. A Baptist congregation began meeting at the Shallows, between Margate and St Peter's, in 1762. 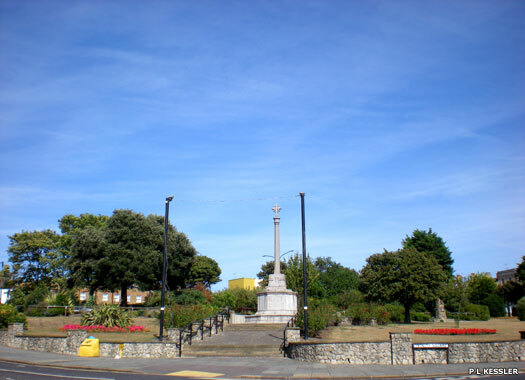 Later an outreach was made to the growing town of Margate, originally meeting in the High Street, before transferring to Love Lane, two streets to the north of New Street. 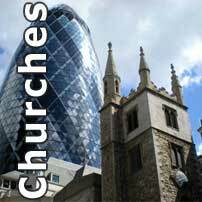 In 1800 the Shallows divided into two separate churches, with one remaining nearby in St Peter's. 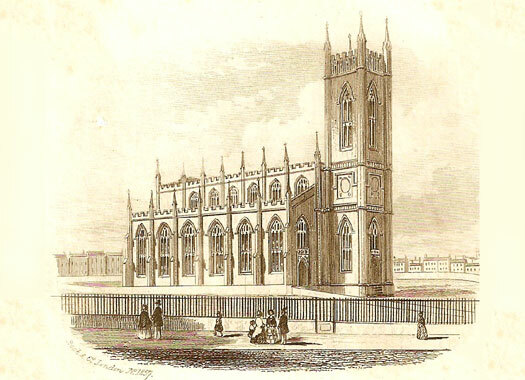 The Margate Church grew rapidly and, in 1815, moved into the current building in New Street, which was called Ebenezer Chapel. This building is still in use today. 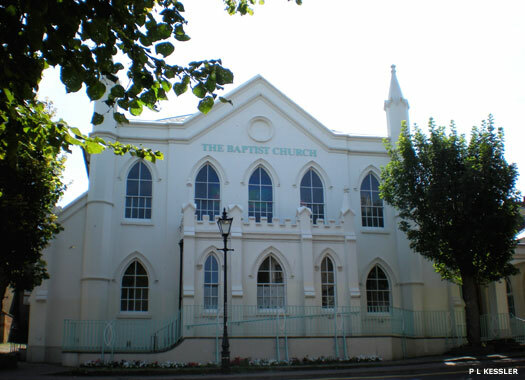 In 1899 the building was extended from the rear into a converted building in Cecil Square, which is the frontage shown here, and the church became known as Cecil Square Baptist Church. The Union Church is on the corner of Union Crescent and Pump Lane, east of Cecil Square. The building was constructed in 1860 at a cost of over £3,000, although some of the land was sold to the Post Office. Next to the church is the former church hall and Sunday School, which was built in 1872. 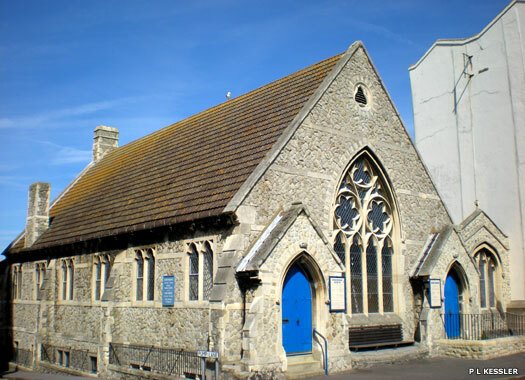 The Methodists and United Reformed Church (formerly the Congregationalists) in Margate combined, probably in the 1980s or 1990s, to produce the Union Church. The old church building became too large for the needs of the congregation, and perhaps too expensive to maintain, so in 1982 they moved into the church hall (shown here). The rear was extended in 1987 to provide improved access, so that the building now has entrances in Union Crescent to the main upper floor and in Union Row to the lower floor with kitchen, coffee lounge and function rooms. The old church building was sold to local Moslems and is now Margate Mosque. The Salvation Army Margate Citadel is at the eastern end of Union Crescent, on the corner of Addington Street. The town was the home of George Scott Railton (1849-1913), son of a Methodist minister and one of the unique personalities who helped form the character of the Salvation Army, so it was natural that a citadel be founded here, probably at the start of the twentieth century. After his death, Railton was laid to rest next to the movement's founder William Booth. The site of Holy Trinity Church as seen from the south, is on Trinity Square. 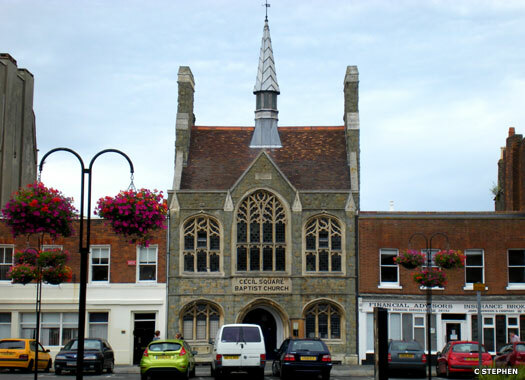 The church's foundation stone was laid in 1825 by Dr Manners-Sutton, archbishop of Canterbury, and the elegant building was designed by architect Mr William Edmunds of Margate. In 1829 the church was consecrated by Dr William Howley, the new archbishop of Canterbury, and a bell was purchased from Thomas Mears. It was hung for ringing in a large frame 2.9 metres (9 feet 6 inches) high. This line drawing shows the former church from the north, with Margate lying beyond. In 1943 it was struck by an enemy bomb which failed to detonate properly. 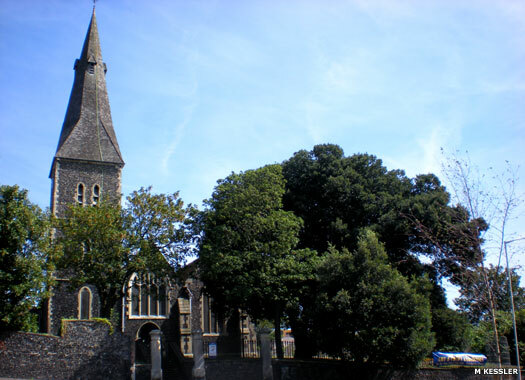 The bells and contents survived, and services continued in the hall for some time, but in 1956 these moved to St Mary's Chapel in Northdown Park (now Holy Trinity, Cliftonville). The old building was demolished in 1958 and the site is now a car park, with a perimeter wall built from the church's stonework. Two photos on this page contributed by M Kessler, and one by C Stephen.